This summer, we had a problem with water in the basement. With our son in the hospital, it didn't exactly take a high priority, but eventually we had to get it taken care of, as it was bringing in a lot of sediment and mildew (and mold is one of my biggest allergy-triggers). I realized, though, that for a problem like this, where I had what appeared to be water seeping into the basement from an unknown source (was it coming in from underground, a broken pipe, or a leaky vent to the outside? ), I had no idea who to call. That's when someone directed me to the web site, ServiceMagic.com. "Get Matched to Top-Rated Service Professionals", their site proclaims. So, I created an account and described my problem. I thought this would be a good opportunity to use my brand new Google Voice phone number, too (720-23-YAKKO :D ), as I wouldn't have to provide my cell or home telephone number, just in case. As you will see, this turned out to be quite a blessing. I got a call from a company to come out and take a look. Unfortunately (or fortunately), they had one time available that week that didn't work for me, and the next available time was several weeks away. I went ahead and scheduled that other time. I then called my insurance agent, and from them I got a list of contractors they used. (I also checked to see if my homeowner's policy would cover this water damage, which, alas, it didn't.) I called one of their "preferred contractors", and they were able to schedule a time in the much more immediate future. In the meantime, I got another call from the contractor that ServiceMagic referred to me, asking again if I wanted the time that wouldn't work for me. (Note that these calls were going to my Google Voice number, so they would leave a message and I would call them back.) The contact number was very different, leading me to believe that I first was contacted by a scheduling service before and the local contractor later. Whether the scheduler was a part of ServiceMagic, the contractor, or some third-party go-between, I'm not sure. But in any case, I again verified my appointment for several weeks out. The contractor I contacted through my insurance agent came out and diagnosed the problem as a leaky drainage pan with the air conditioner. We then scheduled an appointment with the HVAC company to come out and fix that (and reconsidered an annual maintenance contract with them), and the leak was taken care of. (It actually cost us twice as much more for the contractor to diagnose the problem, than it did for the HVAC guys to fix it.) Problem solved, I then called the other contractor — the one referred to me by ServiceMagic — and canceled my appointment. The contractor has since contacted me a couple more times (once by phone and once in a letter), and ServiceMagic once (e-mail), about that appointment directly. Basically, the nature of the messages have been "if you reconsider, we can still help you". Nothing outrageous, and nothing to get too upset about. What has been extremely annoying have been the completely unsolicited calls I've received, totally unrelated to this project. I had three calls attempting to schedule a time to install carbon monoxide detectors in my basement (one claiming it was required to meet compliance for rental properties — my home is not a rental; and anyway, I already have a CO alarm in my basement), and one was a plumber that was, as his message said, "calling to verify our appointment in a half an hour" (I of course had made no such appointment). Again, fortunately, this is all going to my Google Voice phone number, so I'm not bothered at work or at home by these phone calls for random services I did not order or do not want. However, it still bothers me that ServiceMagic.com seems to be giving out my personal information to contractors that have nothing to do with me, without my authorization (I did actually click an OK before the first contractor called me). So far, I only have to listen to and ignore their messages; heaven help them if someone comes to my doorstep claiming they have an appointment. And how do I know this is coming from ServiceMagic? Well, not only are these contractor-type phone calls that came in after I requested some kind of home service, but they are coming to a phone number that I had never before used or published. Could Google Voice (or, its former name, "Grand Central") have obtained this phone number from a pool of "recycled" numbers from someone who just happened to be a rental property owner who hired a plumber this month? Maybe, but that's an awfully large coincidence. Could my information have leaked out not from ServiceMagic, but from the contractor they worked with or some third party in between (such as the "scheduling agent" who first contacted me, whom I am not certain about)? Again, possibly; but that would reveal a potential danger in the whole process of obtaining a contractor through ServiceMagic.com anyway. I have since changed my personal information on my ServiceMagic.com account to something more or less random. I most certainly will not be using them again, and I would encourage everyone else to avoid them as well. Last week, we welcomed our fourth child into this world. I certainly don't mean to belittle his arrival or how happy we are to have another healthy boy in our family, but compared to our last experience, this one was rather uneventful. My wife, who had been having a lot of Braxton Hicks contractions this pregnancy, had just sat down to rest, and I had just sent the kids upstairs to get ready for bed while I finished up a couple rounds of a videogame I was playing. After a bit, though, she said, "I think I'm in labor." The contractions didn't go away with sitting down, and they were coming regularly. She made the required phone calls, and I turned the game off and went upstairs to hurry the kids into their sleepwear and grab the sleeping bags — their overnight bags were already packed. We loaded them up, dropped them off at a friend's for the night, and went to the hospital. Just as we were pulling into the parking lot, we finally got a call from the obstetrician. He hadn't called yet, as he was in the middle of another baby delivery at the time at a hospital about 10 minutes away, and he had another delivery coming. Knowing how fast my wife tends to deliver, he wasn't confident he could call another doctor and get them to our hospital in time, so he asked if we could come there. The contractions hadn't gotten any faster or harder yet, so we turned the car around and drove down the highway to the next hospital. We got there and had to fill out paperwork (because we had preregistered only at the other hospital), then got checked into the room as her contractions finally started to get hard enough to hurt. The doctor came in, broke her water, the contractions really started, and before long, we had another healthy baby boy, just about two hours from the time my wife told me "I think I'm in labor." Yeah, my wife tends to make a lot of women jealous in that respect. Strangely, though, they're not too jealous of her having a baby on the couch. Go figure. I was called as the Cubmaster for the Cub Scout pack sponsored by our Church, and last month, I had the opportunity to award the Arrow of Light to one of our boys. I looked up some various ceremony ideas online, and I remembered seeing a couple where the Cubmaster would identify seven virtues with the seven rays coming from the sun on the award. I figured that would be a decent idea to go with, and I found a ceremony that had those seven virtues. But I needed something visual to go with it, something that would make it special and memorable for the Cub instead of just some old guy standing in front of him reading a speech. I had seen the ceremony before where there was a model of the Arrow of Light, and seven lightbulbs or some other electrical contraption wired up so that each of the rays could light up with each of the seven virtues. The only problem was, I never saw one actually working. Seems like there was always something wrong — a loose wire, a lack of lightbulbs, no access to a power outlet — that it ended up just being some old guy standing in front of the model reading a speech anyway. I decided to do the same concept, but simplify it quite a bit. I have zero electrical engineering talent anyway, so I doubted I'd be able to wire anything up, but I figured something that wasn't wired at all would stand a greater chance of actually working when called for. My concept was simple: create a box large enough to hold a battery-powered lantern inside, cut out the Arrow of Light in one face, and cover the rays of the sun with something that could be revealed one at a time as the virtues are announced. Making the Arrow of Light front panel was, naturally, the hard part. I originally thought I would make it out of scrap wood, but my wife, who is far more craft-wise, suggested sheets of ¼" foam core instead. We found an outline picture of the Arrow of Light badge, enlarged it, and printed it out for a guide. The proportions weren't exactly right, but it worked out with only minor adjustments. The rays on the top of the sun obviously don't hit the border of the panel, either; rather, we made them all approximately the same size and shape. Foam core cuts fairly easily with an exacto-knife, although by the end of the cutting, my arm was good and tired. I cut out the arrow and the sun, and the ray pieces I cut and kept, numbering them so I would know exactly which one went back where for a "perfect fit". I also cut thin strips to create the border. Next came painting. It took two or three coats of blue craft paint to turn the whole panel blue, but the hard part was painting the ¼" seam inside the cuts (so as not to have a really ugly white border around every opening). Foam core doesn't make a clean cut on the inside, and it involved a lot of jabbing the paint brush into bits of styrofoam to turn it all blue. The border sticks, on the other hand, just took a quick brushing of yellow. 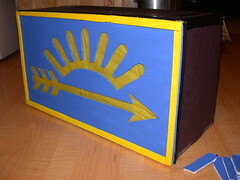 To turn the inside yellow, I used yellow tissue paper and covered the interior side of the panel. My wife suggested using a layer of clear vinyl first, to protect the tissue paper from being destroyed by curious fingers, but I was afraid it would be too shiny and would distract from the effect. I thought it was a good idea, though, so I thought I'd mention it here. I posted some more pictures of the box from various angles over on Flickr; click either of the thumbnails or this link. As I mentioned in my last bandwidth post, I finally subscribed to Netflix so I could play with the instant streaming option. I've only had it for a week, but I've already collected a few thoughts. 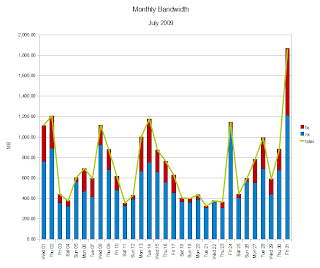 I'll save my bandwidth comments for the end of the month in my traditional bandwidth post (although the numbers so far are encouraging). However, even if the selection is limited, there's still some interesting movies worth watching. And the nice thing is, they're available to watch at any time. I've found movies I had been curious about seeing for a while, but just haven't wanted to invest the time in renting from the video store. There are also a few kids' videos. Again, not everything is available, but it's nice to have a couple Thomas the Tank Engine videos available on demand when the toddler needs some down-time. There are still some disadvantages to the service. For instance, although having the aforementioned Thomas videos on demand are nice, they're only available when my internet connection is stable, and they're only available on the Xbox 360 in the family room, not, say, on the DVD player upstairs or in the minivan. Also, Netflix Streaming does not support captions. We've been in the habit of having closed-captioning turned on and the TV not so loud. But when watching a movie on Netflix, we have to crank the volume higher than normal to make sure we don't miss anything. Another down side, the Netflix Streaming movies include only the movie. There have been no (as far as I've seen) options for director's commentary tracks or any other bonus extras. My kids have watched Who Framed Roger Rabbit? twice so far, but the second time they tried to watch it, it quit very near the ending as our internet connection hiccupped and knocked the 360 temporarily offline. Every time we watch a movie, even if it's the same one over and over, it must be streamed across the internet anew, consuming bandwidth. In summary, I think Netflix Streaming is no replacement for actual DVDs. (In fact, replacing all physical media for all-digital downloads and/or streaming is, I think, a recipe for disaster for consumers; which is something I've ranted about on my gaming blog at length.) But for a quick, no-commitment, no-frills, impulse rental (not to mention for no additional cost once you have a subscription to the service), it does the job well. As I continue to monitor my own usage for my Comcast internet service, I note that, at some point, I was intending to compare my numbers to the numbers that Comcast itself reports that I am using. However, it appears, after having implemented this cap 10 months ago, Comcast still has not released a bandwidth meter to their customers. How it is they can get away with limiting your usage without telling you your usage is beyond me, but there it is. Totals are 16.95GB down, 4.97GB up, for 21.92GB total. There's a huge spike on the 31st, which might have to do with watching a lot of YouTube videos of "Literal Videos". I activated my Netflix free trial today, and seeing all the movies and shows available for my kids, I can already tell it's going to get a lot of use and be well worth it.